Whether you’re looking for your first client right out of your coaching Academy or you’re a seasoned pro ready to finally kick the champagne one-day dry toast cycle to the kerb, these tweaks and features will get you there. The thing is right now there is a heck of a lot of competition online, there are over 2.2 million small businesses in Australia alone! So it’s no wonder that the fresh faced enthusiasm kinda runs out after a while. I remember when I first started Morris Bear, way back in 2008, I was caring for my mum and desperate for some pocket money. You see I wanted to buy my first car, and the budget that I had to work with left me looking at beat up, paint faded gree Excels! So once I figured out that my inner nerd could help me I did what most entrepreneurs do, I started spamming every forum that I could think of, way back when Facebook groups didn’t exist. while a lot has changed (Facebook addictions, Retargeting pixels or being inundated with over 5000 advertising messages in a day!) a lot has still stayed the same, thankfully. While a lot has changed (Facebook addictions, Retargeting pixels or being inundated with over 5000 advertising messages in a day!) a lot has still stayed the same, I know see tons of entrepreneurs not making the most of their own domain. You see if you’re getting traffic to your website but you’re not getting any bookings, you don’t have a traffic problem you have fundamental flaws in your website. 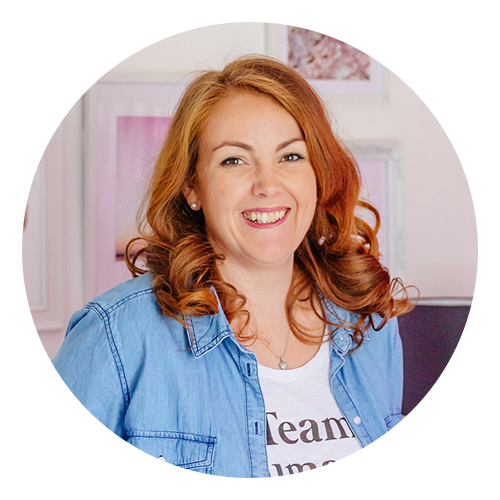 Over the last 9 years trends have come and gone, ways we work with clients has evolved and so has all the technology that is accessible (hello-sign I love you!) but these fundamentals have remained. By implementing just one or two of these details to your coaching website you’ll be able to communicate your value far easier, interact with visitors to your site and ultimately improve your bottom line. 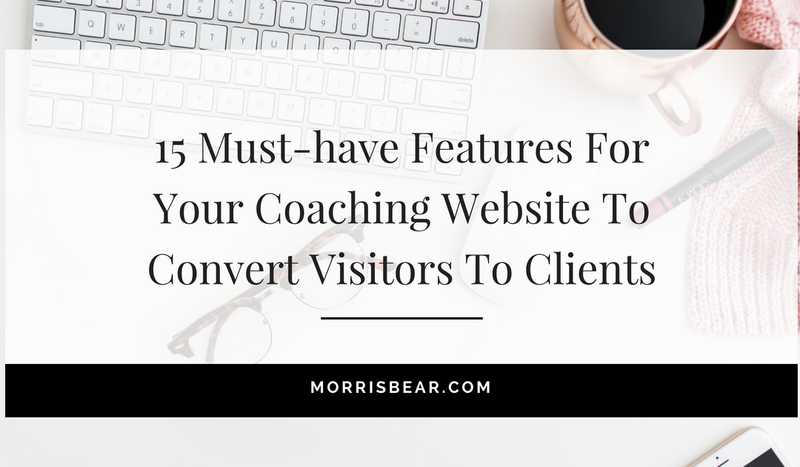 Without further adieu, here are 15 must have features to include on your coaching website. Professional headshots are a must! As a coach, you need to build instant rapport with your visitors, or you’re not going to have any clients baring their souls to you. So ditch the Saturday night selfie and invest in a quality photo. The bonus here is that it also boosts your profile for media requests and guest posts. One point to note: be realistic with your photo, if you wouldn’t be caught dead in a dress don’t don 8-inch stilettos and a bright pink skirt. Be real with your visitors – they’ll repay you in loyalty. It’s awkward but it’s a great idea to have your face front and center on your homepage – just like the front page of Morris Bear. Specific details of how you work. Either you offer personalized sessions or you’ve created a group program, make sure that you have a straightforward process (something like this how your website design works section). Especially in an intimate niche, your clients are wanting help, but that’s quite scary and the more information that you can provide the better. I’m not going to lie this one has had me personally stumped for years. The basic definition is one sentence, value packed, easy to understand description of what you do. It’s tricky. But when you get it, you’ve got it. And it will make your marketing so much easier. Visible contact links AND a custom intake form. Every coach has a different method and process and so asking the exact questions that you need to discover before your first connection. This not only gives your clients a feel for everything you need as well as stopping the endless back and forth emails to book a session. Check out the website design application that I use here. Following from that, a booking calendar will revolutionize your entire practice! And I’m not exaggerating here. By setting your working hours you can work around your family, friends and workouts and your clients can find a time that suits them for exactly the same reasons. It also stops the back and forth conversations to determine time zones and getting it all wrong anyway. You can see this in action over here where I book all my website success sessions. A reason for all you’re doing. This is a personal pet peeve of mine – and all of my website design clients get this first off the bat. If you have a domain name you can also have a matching email address. What looks more professional, amy@lifecoach.com or kittylove@hotmail.com? Thought so! That one’s a no brainer – this should be included in your website hosting at no additional cost. People are basic. We like to know what to do next because we’re already making too many decisions daily. So it’s essential to make sure your clients can easily find the right information and contact you. You can do this by directing your clients through your website. An easy to follow journey. Much like you can direct a guest in your home by having a front path to greet them, your website should have a clear path from finding your website, getting to know you and finally booking you. There’s obviously a few more stops involved but that’s the basics of it. This is insanely important to deliver an amazing experience for you clients, and one of those things that I totally geek out over. In fact, it’s an entire module in all of my website design packages. Simply put, testimonials from previous or current clients. Perfect things to include are results they’ve seen or changes that have affected them. Wherever possible be sure to include a photo. This makes the quote more relatable and increases a client’s trust in you. I’m sure there are a million questions that you answer over and over with each new client. The thing is how many visitors aren’t contacting you because they’re afraid to ask? By answering the most common questions on your website you can put your client’s mind at ease and encourage them to book a session. What gets measured gets improved upon. By monitoring your website traffic you can find out information about your clients – including where your visitors live, if they’re viewing the site on a mobile or desktop computer, analytics will also give you info on what people are searching for when they get to your site so that you can create more and more content that keeps a steady flow of visitors coming to your site. I’m not saying you need to be posting every day – I’m not sure how anyone can manage that! But including timeless information in the form of a blog post, you’ll solidify your reputation and search engines will love you for it. Win-win! Your blog should be an extension of your website and be consistent with design. 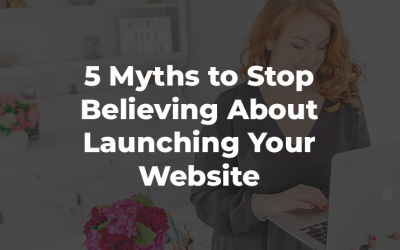 It’s a good idea to have a few posts ready to launch along with the rest of your website. It still shocks me that there are websites that aren’t user-friendly for mobile phones. 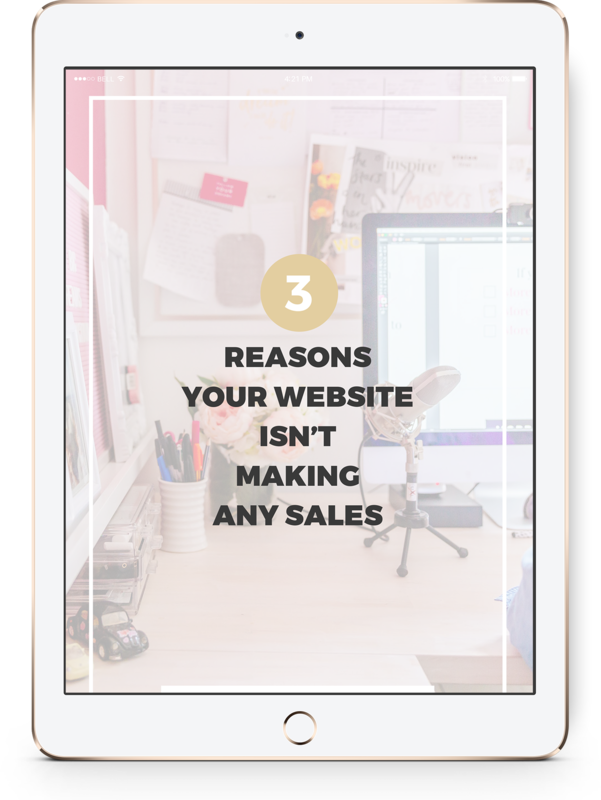 Over 90% of internet users are browsing on their phone – if your website doesn’t allow your visitors to easily read the text, click buttons and get in touch with you you’re missing out on a huge piece of the pie. You’ll also be missing out on a lot of search engine traffic as Google is now punishing websites that aren’t mobile friendly. Read more about the Google mobile algorithm here. With the attention spans of goldfish were always looking for the quick fix and if your website is taking too long to load you’re missing out on traffic. Not only do your visitors expect a quick load time but so does Google. The world’s largest search engines main purpose is to provide the best resources for their readers, so if your competitor’s website loads twice as fast guess who’s site they’re recommending first. You guessed it. There are a number of ways to decrease the load time of your site, the main being your website host. Having a local website hosting company protecting your site will drastically improve the experience for local visitors. 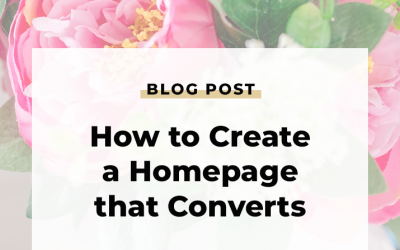 Each of these elements will improve the conversions on your website, imagine what would happen if you were to create your website including all of these! You’d be flying. So tell me, how many of these tactics are missing from your website? Let me know in the comments.